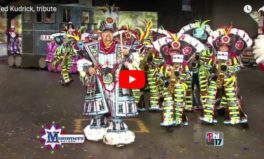 phillymummers – Home of the Philadelphia Mummers Parade! Plan to join us on New Year’s Day! 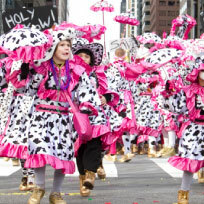 The New Year’s Day parade is a 118 year, unique Philadelphia tradition that is pure fun, enjoyment, and folk art, has withstood the test of time because of the strength of the diverse communities the mummers represent. All Mummers leadership has received special training on appropriate satire. We encourage all those who will be participating in the New Year’s Day Parade to watch these videos and let’s make this year’s parade the best ever! 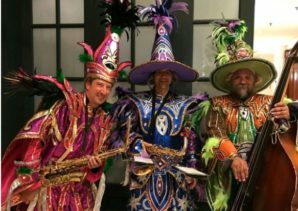 The Mummers are involved in many community support activities throughout the year, while they’re not entertaining us on New Year’s Day. 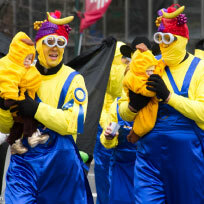 (John) McDevitt, 46, of Wenonah, is making a parade comeback on New Year’s Day after a one-year hiatus. A health scare last year kept him on the sidelines. He was recuperating from surgery a week before Christmas 2016 to remove a two-centimeter lesion from his brain. 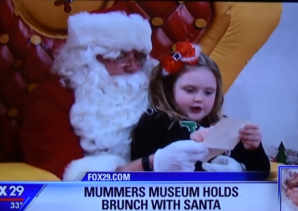 Mummers Museum holds brunch with Santa Santa was hanging at the Mummers Museum for brunch! 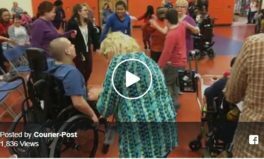 See the Fox 29 story here! 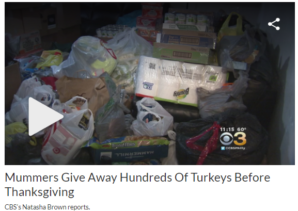 CBS 3: Mummers give away hundreds of turkeys before Thanksgiving. 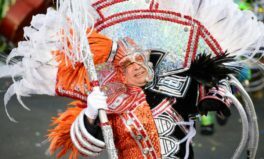 Tomorrow, unless officials change plans due to weather, Fralinger and several other bands and brigades will parade down Broad Street in Philadelphia for the 118th Mummers Parade on New Year’s Day. 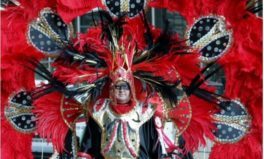 Finding the true source of how the Mummers Parade began is as complicated and elusive as reloading the SEPTA Key. 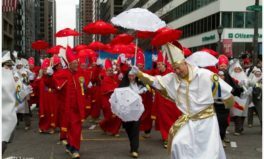 The annual event dates to European folk festivals, and although known as a deep South Philly tradition ingrained in Irish and Italian communities, some in the Jewish community have paraded along Broad Street for decades. 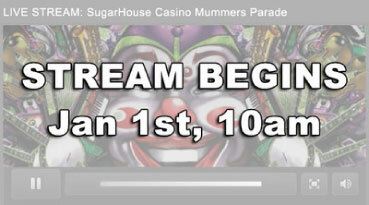 January 1st is a day that belongs to the Mummers in Philadelphia. 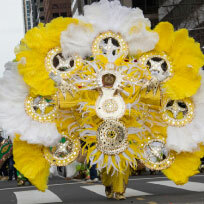 New Year’s Day is filled with their partying in Center City and South Philadelphia. But why? 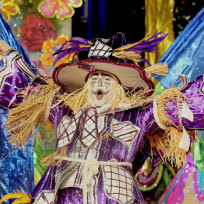 What exactly is a Mummer? How did the parade start? We’ve found the answers for you. We’re #1! 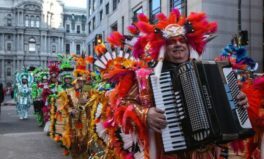 Philadelphia’s Mummers Parade has been named America’s No. 1 Holiday Parade by USA Today’s Reader’s Choice 2017. 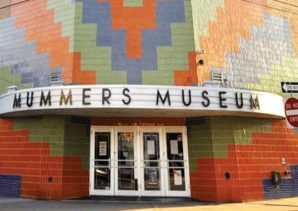 According to the Mummers Museum, the Mummers Parade in Philadelphia is the oldest continuous folk parade in the United States. 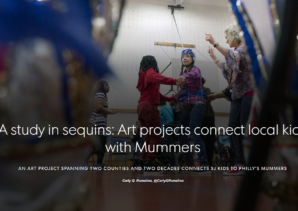 And although we traditionally associate Mummers as having their roots in the neighborhoods of South Philadelphia, there continues to be a large contingent of Mummers right here in Chester County, thanks to Bud Emig of Phoenixville. It’s the first time Burlington County Special Services Students are meeting real, live MUMMMMMMMMMERS! 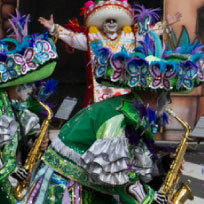 With the Uptown String Band entertaining with its meticulous choreography and colorful sequined costumes, the East Norriton holiday parade crowd may feel like New Year’s Day has arrived a little earlier than expected this year. When Megan Flaherty joined the Duffy String Band at age 10, she was too small to carry her bass drum. So Teddy Kudrick retreated from leading the band to march alongside her, holding the drum as she played. On New Year’s Day, a third generation of Kudricks will produce the next captain: Teddy’s 11-year-old son, Jake. See you New Year’s Day!